We’re so excited to share with you our Easter Market KIDS’ CLUB Colouring Contest for 2019! Get your little one(s) to colour the page. Contest open to kids 12 years of age and under. One entry per child. 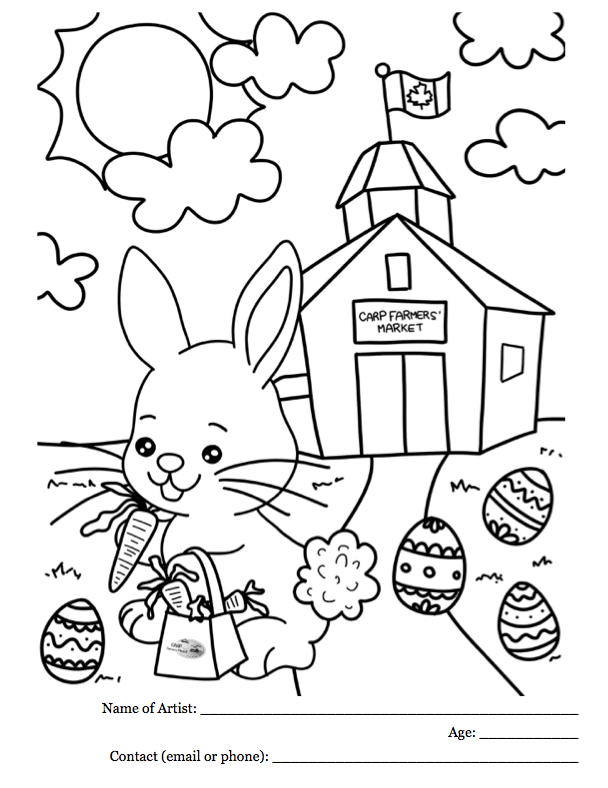 Come to the Carp Farmers’ Market’s Easter Market at the Carp Fairgrounds on April 20th from 8am to 2pm to hand in the completed colouring page! Contest closes at 2pm, April 20th, 2019. All entries MUST be turned in at our Hostess Booth. Entries will NOT be accepted electronically. Entries must be completed ahead of time and will not be available at the Easter Market event. One lucky winner will be chosen and their artwork will be shared on our social media pages! The winner will also receive an Easter basket filled with Easter goodies – to be picked up the weekend of April 20th. Happy colouring!